Our another Magento certification-dedicated article describes the steps for application initialization. Magento initialization process starts in index.php (with the exception of Magento integrated with some other sites or CMS). Let’s take a look at the code of this file. Magento developers made their comments using multi line comment and PHPDoc style comments, so for my own comments I’ll use one line style (so called c++ style) comments. // if not, error message is being displayed; you are suggested to install it once again and exit. Whoops, it looks like you have an invalid PHP version.</h3></div><p>Magento supports PHP 5.2.0 or newer. Now we should dig into app/Mage.php. It contains about 1000 lines (to be precise, it’s 989), so we will explore the most important things only. However, I think it’s a good idea for you to open it and analyze the whole file. At the beginning of the file Magento checks if Compilation mode was enabled. If compiler is not enabled, Magento will include default paths, load code pools, load app/code/core/Mage/functions.php (if it’s not overwritten in local or community pool), load lib/Varien/Autoload.php and finally call Varien_Autoload::register() method. Finally, Magento executes autoload method, which loads all class source codes (and again: depending on whether Compilation mode enabled or not it could go different ways). As you remember, on the last line of index.php there was a call to Mage.php run() method (below I only put ‘try’ piece of this method without catch part). This is an entry point of front end rendering: request and response setters, initialization of global observers collection, etc. Next, have a look at Mage_Core_Model_App::run() where most of app initialization work is done, i.e. config loading, request and routing initialization – so this method can be called the heart of application initialization process! * Run application. Run process responsible for request processing and sending response. In this method, Magento calls $this->baseInit($options), which in turn loads Mage::getConfig and _init that initializes base system configuration (local.xml and config.xml files) (base configuration provides ability to initialize DB connection and cache backend) by calling loadBase in app/code/core/Mage/Core/Model/Config.php. After we loaded local.xml and config.xml files, Magento runs _initModules() of the same class. It, by-turn, initializes active modules configuration and data via Mage_Core_Model_Config::loadModules(). In this loadModules method, Magento loads all active modules from “etc” folders and combines data from the specified xml file names to one object with the help of loadModulesConfiguration(). And finally we have $this->getFrontController()->dispatch() So routing here is the domain of front controller. We already have the article on front controller pattern by Aleksander Tretjak describing its work in details. I think that it’s always better to have a look into the source code to understand how things work, but in this case it’d be very helpful to see this request flow on the image. 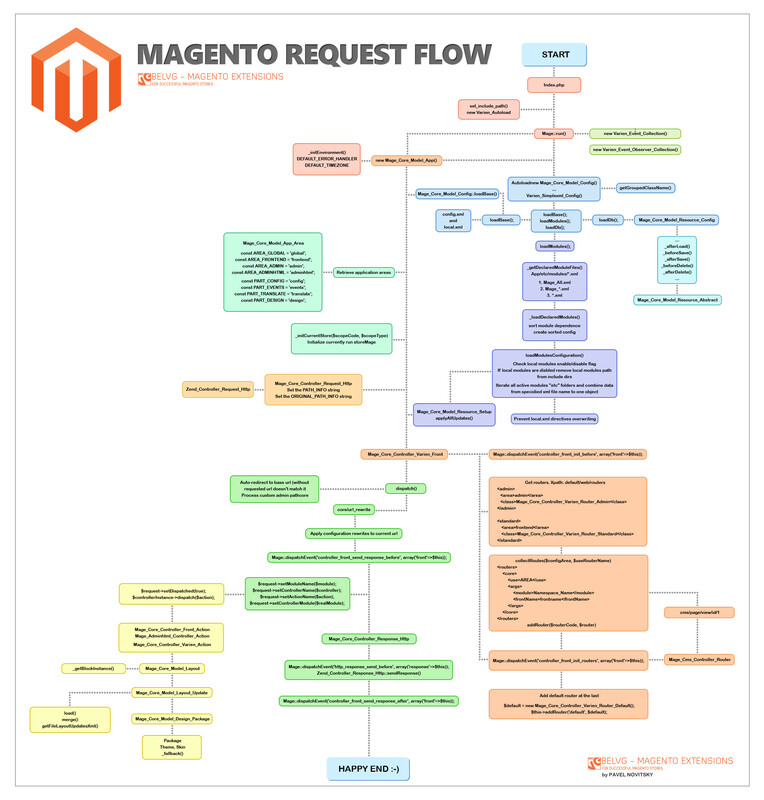 Here is a Magento request flow made by Pavel Novitsky. I have passed Magento Developer Plus Exam (M70-201) today. Thank you so much for the wonderful articles on Magento exam. Congrats and thank you for your kind words, much appreciated!